ROBOTILL allows you to split a bill (sale/check). This is used when a waiter has been serving a table as a single sale and at the end of the sale (or at some point while serving the table), the customers decide to split the bill/sale. You can split a bill/sale into multiple bills/sales. There are two ways to split a sale. If the customers simply decided to pay different amounts using various cards and or cash payments, you can simply add all the different payment options to the sale. The rest of the article will explain how to do an exact split where specific items needs to be moved to a different bill (order). To split a bill, select the table that you want to split. 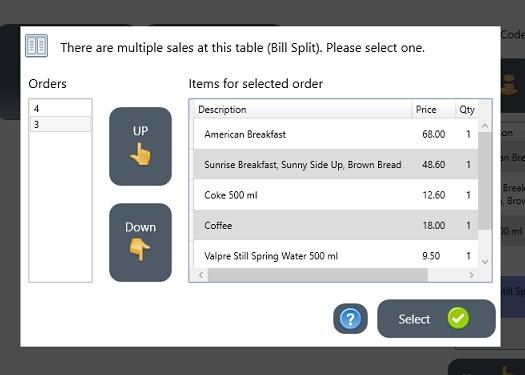 When the sale for that table is selected, click on the Menu button and then 'Split Bill'. The Split Bill screen will open. A new sale will automatically be created. You can now move the items between the two sales. 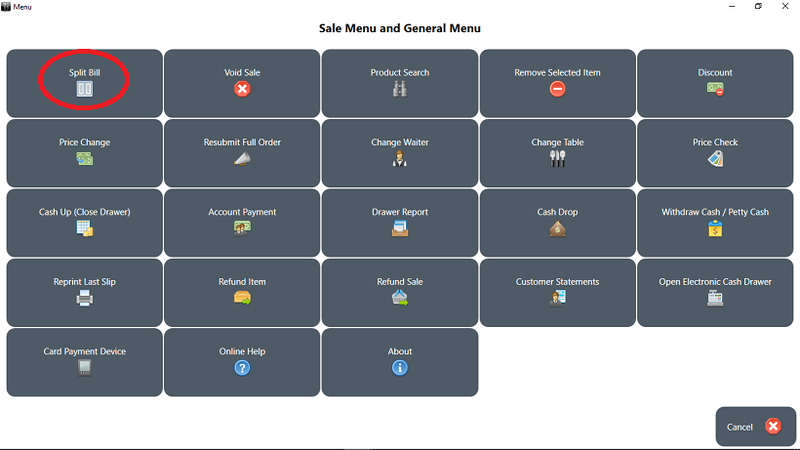 Select the items you want to move and click on the direction buttons to move them between sales. Once you are done, click/touch the 'Done' button. When you clicked on 'Done', the original sale will still be displayed (now with the items removed that was moved to another sale). You can complete the sale and then select the same table again to complete the second bill that was added to the table. If you want to split the sale into more than two separate bills, simply follow the steps above to do the next split. You can split a sale as many times as needed. Note that you can continue adding items to individual sales after a sale was split. If you want to add more items to a sale that was split, or if a sale was split into several bills, you can select the table to choose a sale to work with. The system will detect that there are several open sales linked to that one table. 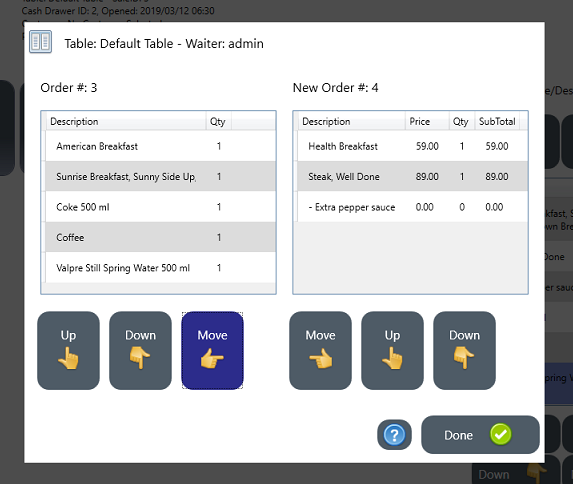 It will then display a 'Sale Selection' screen for that table. You can view each sale at the table by using the 'Up' and 'Down' buttons. Select the sale you want to work with and click on 'Select Sale'. If you want to use this functionality, it is suggested that you change the default settings and choose to add new items instead of increasing the quantity of the same items (most retail shops prefer to rather increase the quantity to prevent till slip wastage). To change this setting, go to Manager > Setup > System Configuration > General Configuration. Uncheck the check box that says 'Increase QTY instead of adding new items'. Click on 'Update General Settings'.